I made a new acquisition that I can't find a lot of information about. It seems like it's a 1970s 28 Volt, DC, 17.9 Amp, 500W generator powered by a 1 cylinder, two stroke, gas engine, with a rip-cord pull start (not recoil!). This seems very similar to the US Department of Defense MEP-024A, but you can see from the diagrams it's slightly different. Searching for all variations of the part numbers on the label has yielded surprisingly little. YouTube video has found some videos of similar, but not identical, rigs. Since this only puts out 28 VDC @ 17.9 AMPS (0.5 KW), and from what related equipment I found with it's NSN, I'm pretty sure this rig would have been used to power auxiliary equipment like signals / communications gear. I believe it would be called a "tactical" generator set, as it's portable. I can take no credit for these spectacular pictures (CLICK THEM! ), all credit goes to Cees Bustraan, who is an avid Ship Spotter for shipspotting.com with over 10,000 pictures to his credit (WOW!). 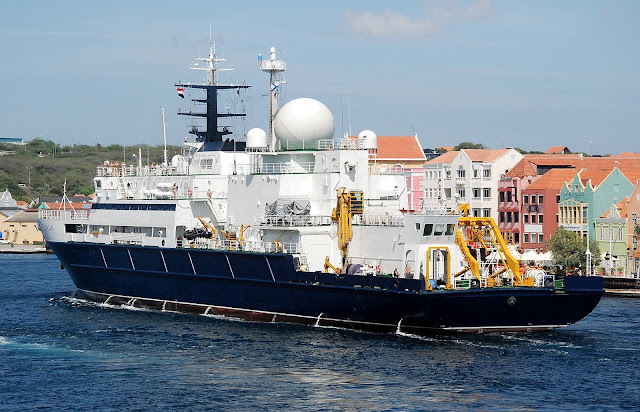 I dropped him a line; he'd been monitoring the RV Yantar's progress towards Willemstad, and took pictures of it as in came in to port today, just in the nick of time since it was almost a full day ahead of schedule according to the port authority. Original resolution versions are available at ShipSpotting.com, and you can almost make out the faces of the crew coming into harbour, snapping pictures with their cameras - I bet they're happy to see land! My previous post about the RV Yantar (Янтарь), an Auxiliary General Oceanographic Research AGOR (that may have some AGI-like hobbies), along with some background info, can be found here. Recently I've been reminded that I have a lot of help from the "Twiterverse", "Blogosphere", and whatever other catchy names I can think of to describe the international community that I tap into online, to glean information about current and past events. The following is is limited number of twitter accounts and blogs you might want to follow if you're interested in similar topics. While looking for information about historic military bases in Cuba, several names of locations were mentioned that I had no familiarity with. Somehow, Cuban geography wasn't something I picked up in school. So, I slapped this together with the available information I had at my disposal. It's not complete, and may not even be up to date, but I made it as a visual aid for myself and figured I'd share in case it helped someone else. The Russian Naval Research Vessel Yantar (Янтарь), classified as an Auxiliary General Oceanographic Research (AGOR), with underwater rescue capability, was commissioned earlier this year. Two more for the Pacific fleet, and one more for the Northern Fleet are planned. The ship is also known by it's designation "Project 22010". It is rumoured to have been commissioned by the secretive GUGI (An acronym for what roughly translates to Main Directorate for Deep Sea Research) a part of the Ministry of Defence of Russia which is responsible for "underwater engineering" which is a "euphemism meaning spying by means of planting, tampering with or stealing objects underwater" (source) I believe this is the equivalent of the National Underwater Reconnaissance Office in the United States. 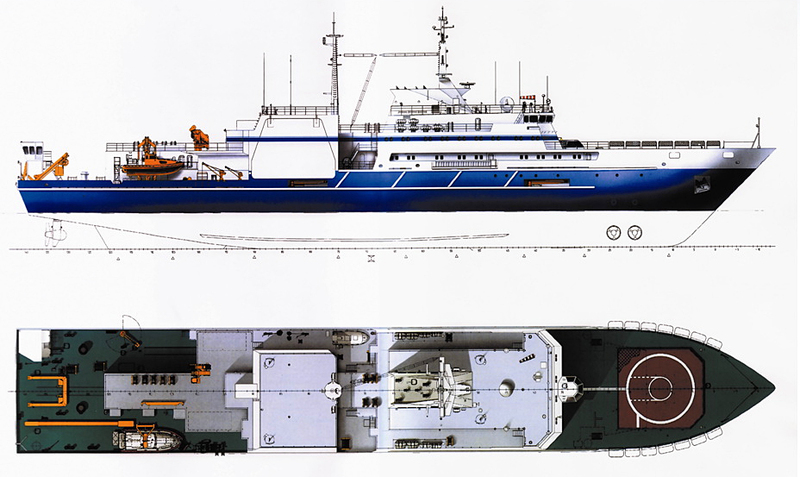 If Warefare.be is correct, and the ship has been assigned to the 29th Special Squadron of the Northern Fleet, its home port is Olenya Guba (Оле́нья Губа), where a secret reconnaissance submarine base is located, and the 29 Special Sqadron is also the unit which those submarines are associated with. I'm going to go out on a limb and bet this isn't your typical AGOR. 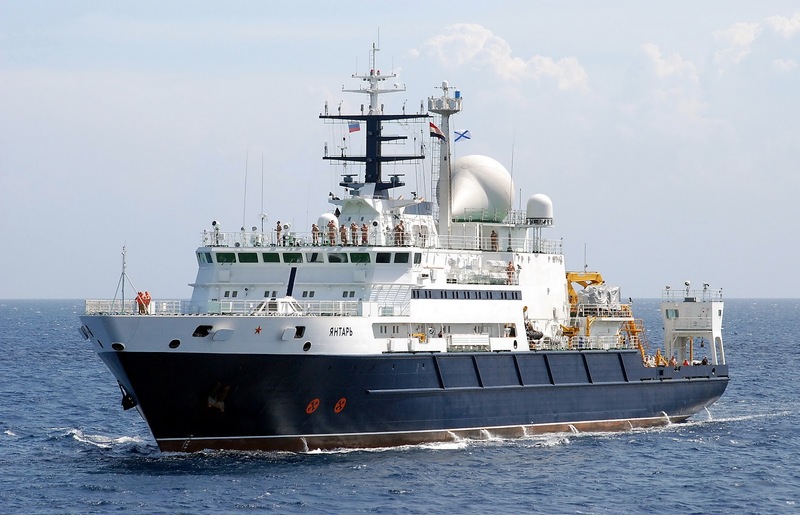 Trivia: "Yantar" means Amber, in Russian, and is named after the shipyard that bears the same name, and celebrated its 65th Anniversary in 2010 when the keel for the ship was laid down, and 70th anniversary when the ship was commissioned. - 2 x DB-VA 280 x 280 kW. 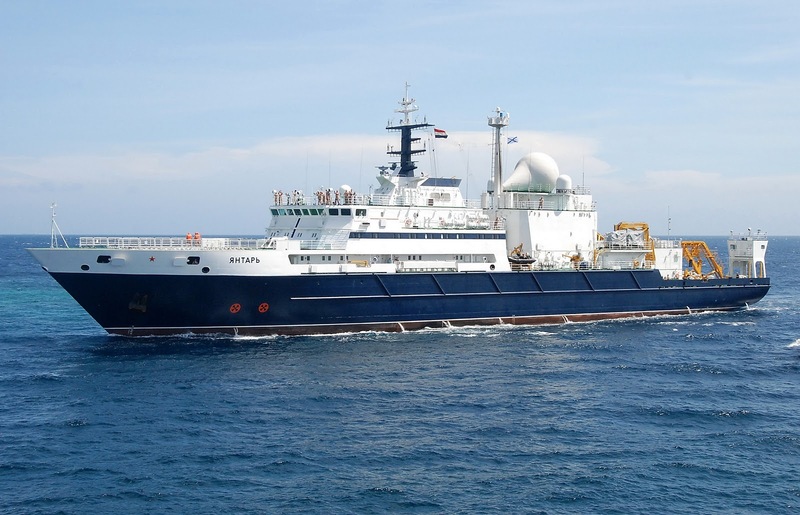 Unmanned remotely operated vehicles and manned submersibles (type Rus, Consul, Mir) for research of the sea bed. From what I gather from open source sources (mainly social media), she arrived off the coast of Nova Scotia (Canada) around August 24th 2015, and headed South along the United States East coast, keeping outside of terrestrial AIS range, but continuing to keep her satellite AIS transponder on. It seems to be headed towards Cuba, but unlike the track the Nikolay Chiker took last year, it is keeping well away from US Waters and may be headed to Cuba or Nicaragua at this point. MarineTraffic.com has an itinerary listed that the ship should arrive in the port of Baltiysk, Kalingrad (Russia) on November 13th 2015. That's a hell of a detour for some cigars! 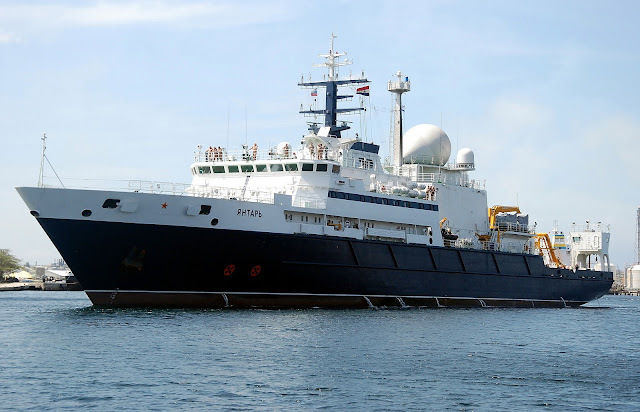 Olenya Guba (Оле́нья Губа) is the home to the 29th Special Squadron of the Russian Navy, which I believe operates their reconnaissance submarines. 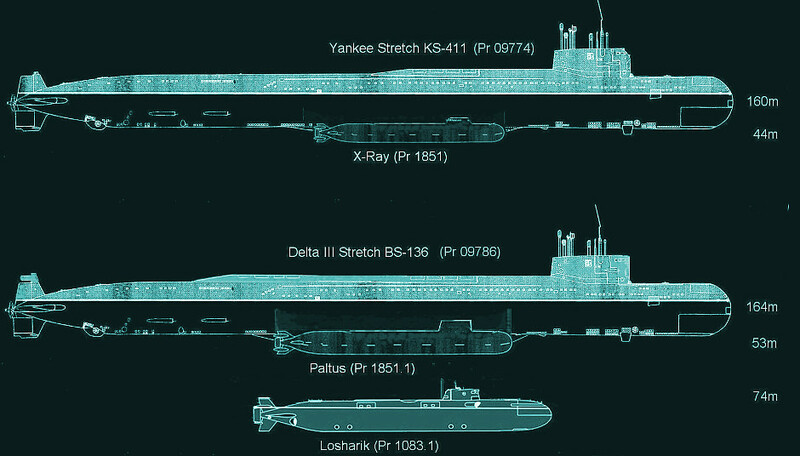 It is home to the BS-136 "Delta-III Stretch" submarine, which was a Delta-III nuclear ballistic missile submarine retrofitted to ferry mini-subs and act as a mother ship to them. That the RV Yantar was assigned to the 29th Special Sqadron says something about it's purpose and mission.